I am very lucky to have a supportive family. Be it my decision to work after having a kid, or taking up a new exercise regimen or my hobby – my family is very supportive. My mother-in-law especially loves the fact that I knit. She does a bit of crochet here and there, but she thinks my knitting skills are really good. She hasn’t seen any projects from other knitters who are far more better than me, so she is blissfully ignorant and I don’t want to correct her. When my biggest admirer requested for a sweater, I just had to do it. I looked through a lot of patterns and finally decided on Mr GreenJeans by Amy Swenson (ravelry link). I liked the way cables add shaping to the cardigan. I thought this will be flattering on a typical Indian woman (read pear shaped). A very well written pattern, seamless (yay!!!) and is generous on the different sizes. For those with little girls, the same pattern is available for little girls too. 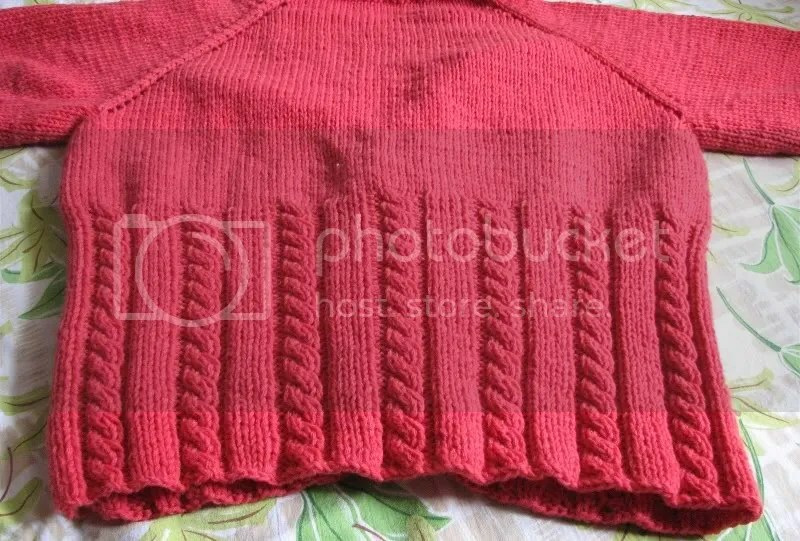 I have knit raglan cardigans before for babies, but was not sure how it will look for an older woman. When my mom tried this on, all my doubts vanished – it looked great on my mom. The neck is too deep for my taste, but looks good. I added buttons all the way down to make the cardigan more practical. The only problem I had with this cardigan is the button band. The bands are knit after picking up stitches along the edges of the body and are worked in 2 x 2 rib. Since this rib is stretchy, it pulled the body stitches along with it and the cardigan looks like it is crunching up its nose and making faces at me. The buttons try to keep the ribbing in place, but it doesn’t help the look. Yarn is from Surya Emporium, Commercial Street. It’s a 4-ply Vardhaman acrylic yarn. I held double to get the gauge. The yarn is soft and squishy and has great stitch definition. I had bought this yarn to make a baby blanket and chose this color because it was neutral, yet cheerful. I have been using this yarn over and over again, but it still doesn’t get over. I have another 100 gms of yarn left! Buttons are from Pydal. I think the yellow ones add a bit of variety to the monotonous red color. The sweater was a Diwali gift to my mother-in-law and she loved it. Mumbai has been especially cold this winter and she is making a good use of her gift. Thanks Anu! So, you exchange knitting tips with your MIL? Thanks for visiting my blog Anjali. Your red jeans looks great too. 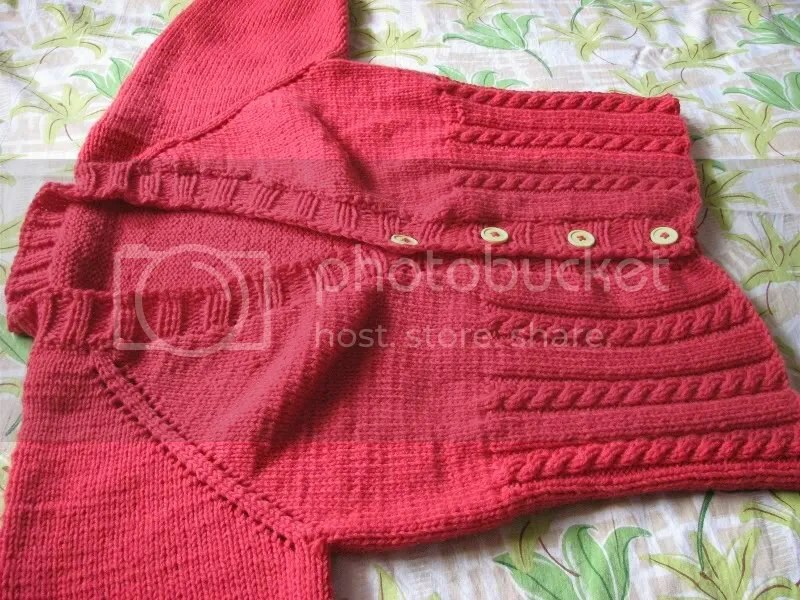 Hai Anjali, the cardie is beautiful. I wish I could get a little patience to knit something like that. Lucky you to have such a supportive MIL. Came across your blog via Ravelry (where else? ), and loved this red cardi. 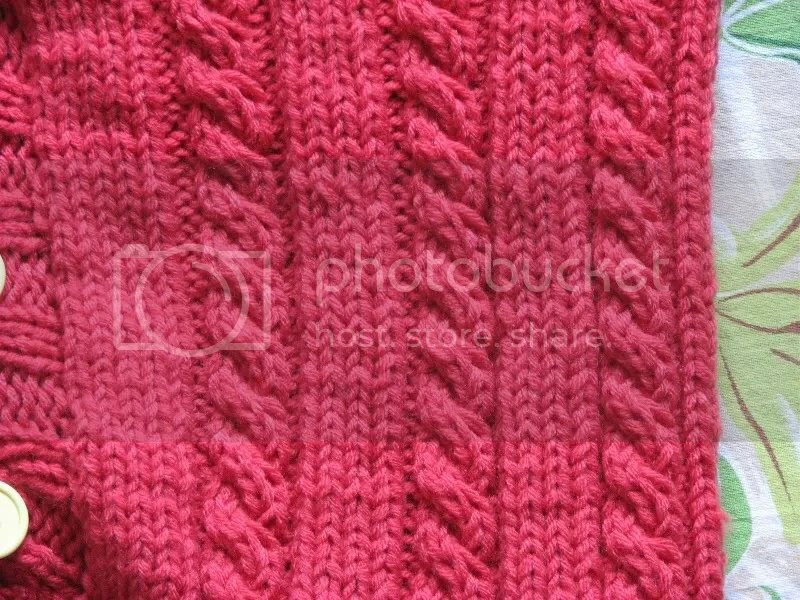 I came across a cure for the puckered look (happens to me all the time when I add a garter border to a stockinette body) in a baby blanket pattern long ago and maybe it’ll be useful for you? Depending on the guage, knit an extra couple of rows back & forth on the garter portion only every 6-8 rows. I.e, if you have a 6k garter border, knit 6, turn, knit6 back, turn again, knit 6 and carry on with stockinette body. Do the same when you start knitting the next row from the other end. This will give the garter border a little more stretch & body to match stockinette’s natural stretch. P.S – your son makes an adorable model ! Great advice! I am going to jot this down in my memory for future use. Thanks for sharing.